Harrison Reed cautions Shelby against dredging up hurtful memories for his close friend, Robert. As they explore the city together, Shelby and Harrison find themselves increasingly drawn to one another. When the contents of the mysterious envelope are revealed, the answer gives her hope for the future of Harmony Lane. Is the time spent in Edinburgh with Harrison destined to be nothing more than a beautiful memory? Did Shelby lose her heart in Edinburgh...or find her way home again? Six months ago, who could have guessed Shelby Harmon would be standing outside a castle? Not your average, run-of-the-mill castle, either, but Edinburgh Castle. Scotland’s national treasure. She breathed in the heady scent of blooming roses and soil dampened by the late morning rain. Shelby’s pulse strummed faster as she followed the winding walkway. Was she crazy to travel nearly four-thousand miles to deliver an envelope containing who-knows-what to a man she’d never met? Perhaps, but a promise was a promise, especially to her dying father. When she glimpsed his profile, Shelby’s breath hitched. The strong resemblance to the man in the faded photograph she’d found among her father’s possessions was undeniable, the only difference being the added refinement of a quarter century. His dark hair was peppered with silver and cut military short, and his faded jeans were tucked into combat boots. The rolled sleeves of his denim work shirt revealed arms tanned a deep brown—an anomaly among the perennially fair-skinned Scottish natives. Shelby had expected to hear more about her father, not her mother. What was Robert’s connection to her parents? Enough to bring her across the world on a personal mission? “You, too.” Harrison’s grip was assured and self-confident, always a good trait. Shelby opened her purse, retrieved a business card from a small engraved case, and handed it to Robert. “I’m staying at the Radisson Blu on The Royal Mile. My cell phone number is on the card. If you’d consider having lunch while I’m in Edinburgh, please give me a call.” A trace of her no-nonsense, professional tone crept into her words. Wonderful. Instead of coming across as friendly, she probably sounded like a controlling, bossy know-it-all. Not exactly the impression she’d hoped to make. “It would seem you inherited more than your looks from Katie.” Amusement laced Robert’s words. He glanced at her business card before tucking it in his front shirt pocket. “One of the top ten worldwide brokerage firms, eh? I’m sure Katie and Tommy are very proud of you, as well they should be. So, you’ve come all the way from Chicago. 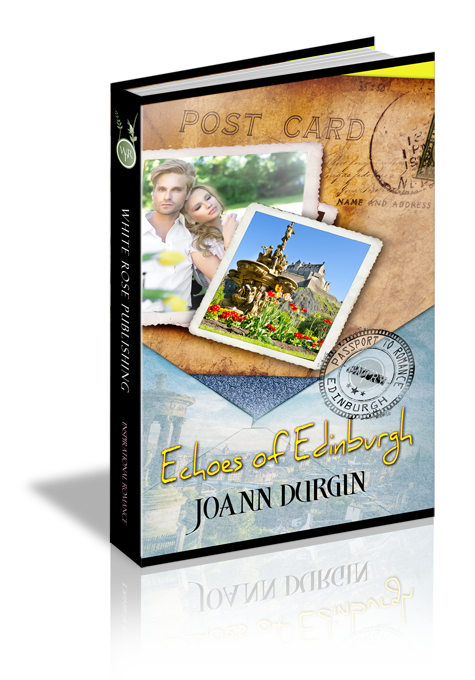 Are you in Edinburgh on business?” The charming way he pronounced Ed-in-ber-ah made her smile. “Of course.” Although she’d planned on meeting with Robert in private, why shouldn’t Harrison come along? The two men obviously shared a close relationship. Harrison’s mesmerizing gaze met hers again. “How about I swing over to the Radisson and meet you in the lobby a few minutes before noon? It’s only a five minute walk to Abernethy’s from there.” His deep southern accent hinted of Alabama or perhaps Mississippi and was as distracting as everything else about this intriguing man. “Ever been to Scotland before, lass?” Robert tugged a work glove back on one hand. “I’m not sure. At least a few days. My airline ticket says a week from Sunday.” Now she’d done it. Must be her subconscious taking over. She’d intended to return home straight away, but as a precaution, she’d cleared her schedule for a little more than a week in case she’d need to track down Robert across the Scottish moors. Thanks to her Aunt Lily, she’d discovered Robert lived in Scotland, and through the wonders of the Internet, she’d located him quite easily. “Long enough to fall in love then,” Robert said. “I think you’ll quickly fall under the charms of...Auld Reekie.” Was that pause purposeful? The corners of Robert’s mouth tipped upward, making her wonder. “I see.” She didn’t, really, but managed a small smile. “I’ll look forward to seeing you both tomorrow.” With a murmured good-bye, Shelby departed, aware the men watched. As the sound of their voices grew faint, she retraced her steps, being mindful of the still somewhat slippery walkway. A few hundred yards away, she sensed movement behind her. Harrison. She’d only just met the man yet she’d know that voice anywhere. How odd. She glanced over her shoulder and drew in a quick breath when she spied the long-stemmed, yellow rose he carried. Walking toward her, he filled her range of vision, exuding a confidence that was masculine and swoon-worthy. She’d always rued that silly description—one the women in her office bandied about when discussing the latest hunk-of-the-moment actor—but Harrison effortlessly earned the title. The ladies would have an absolute field day with this man. Shelby gasped as her right foot slid out from beneath her. Skidding forward, she flailed her arms like a fledgling leaving the nest. But instead of soaring, she was going down fast, and it was not going to be pretty. So much for six years of ballet lessons.